Boston landmarks of past and present include the Boston Stone, the Liberty Stump, and the Pregnant Building. 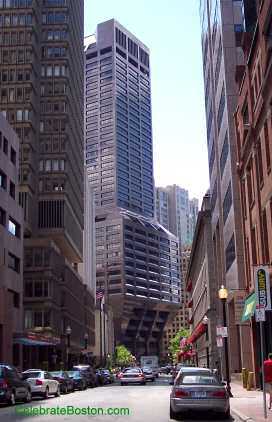 The Pregnant Building is a skyscraper in Boston's Financial District, and is located at Franklin and Congress Streets. The tower has also been called the Building with a Bulge. By design, the building has a bulge of several stories near its base. Completed in 1971, the tower was originally called the First National Bank Building. The architectural style has been described as Art Moderne. Very much like Boston City Hall, the intent of larger stories at higher levels was to allow pedestrians a greater view of the street, but the net result is a feeling that a slab of dark granite is hanging over one's head. The wind can also swirl around in this area due to the size and shape of all the buildings. At the height of skyscraper construction in Boston during the 1980s, one may often have heard the phrase "down by the Pregnant Building," or "next to the Lolly Pop building" when asking for directions in this area (a sculpture resembling a lolly pop tree stood in front of another tower on Summer Street for many years).